This past week I had the chance to make a very unique Indian Jones style bullwhip for a stuntman who lives in Florida. 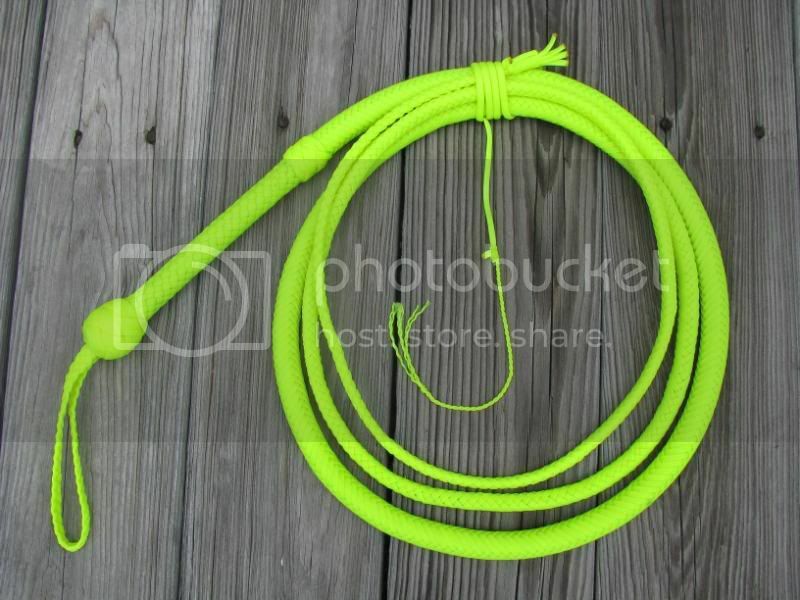 It’s a 10ft, 16 plait bullwhip made neon yellow paracord. It will be used in a blacklight show so it will glow very bright. The fellow who ordered the whip is accustomed to working with actual Indy whips from DavidMorgan.com, so he wanted me to make a nylon that is similar to the whips in which he normally works. While it’s not possible to create a “screen accurate” Indy bull from nylon, it is possible to make a whip that’s somwhat similar. This particular whip is patterned after the whip seen in the first 3 Indiana Jones movies. 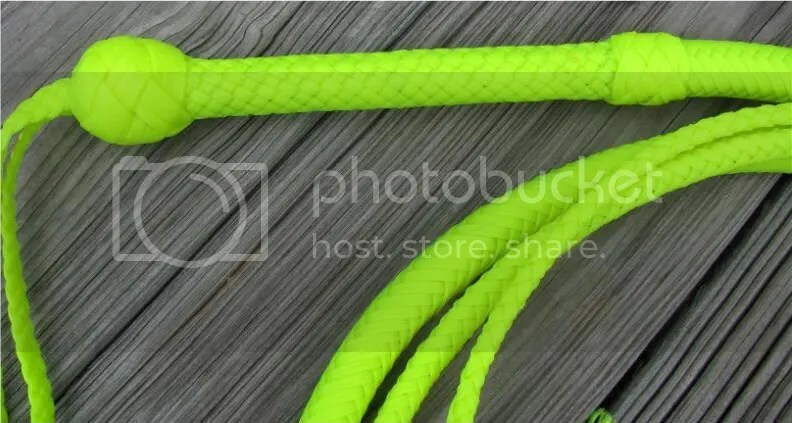 Despite the neon yellow color, I think this whip is about as “Indy” as any nylon whip on the market today (try to imagine it in brown or tan instead!). While I’ve never really targeted the Indiana Jones “gearhead” market, I feel confident that I do offer an affordable line of quality nylon bullwhips that can work for the Indiana Jones enthusiast who can’t afford to shell out the cash for an Indy whip made from leather. Now during my July bullwhip sale, you can order your own 10ft nylon Indy whip for just $162.00 plus shipping. This entry was posted on Saturday, July 11th, 2009 at 7:42 pm	and posted in bullwhips, Indiana Jones, nylon whips, Whips. You can follow any responses to this entry through the RSS 2.0 feed. « The Return of Joe Driver!